It occurred to me that much of the time you look up in this city you could be peering into any number of creatively-charged spaces. 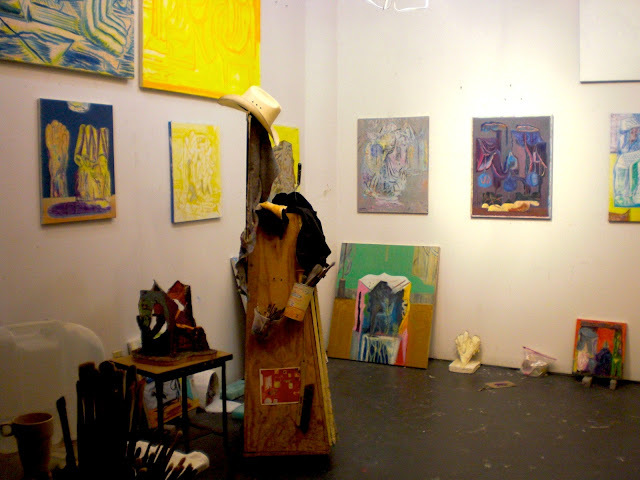 The buildings around us so often being inhabited by artists, stealthily at work, engaging in one of NYC's most respected and beloved practices -- art making. 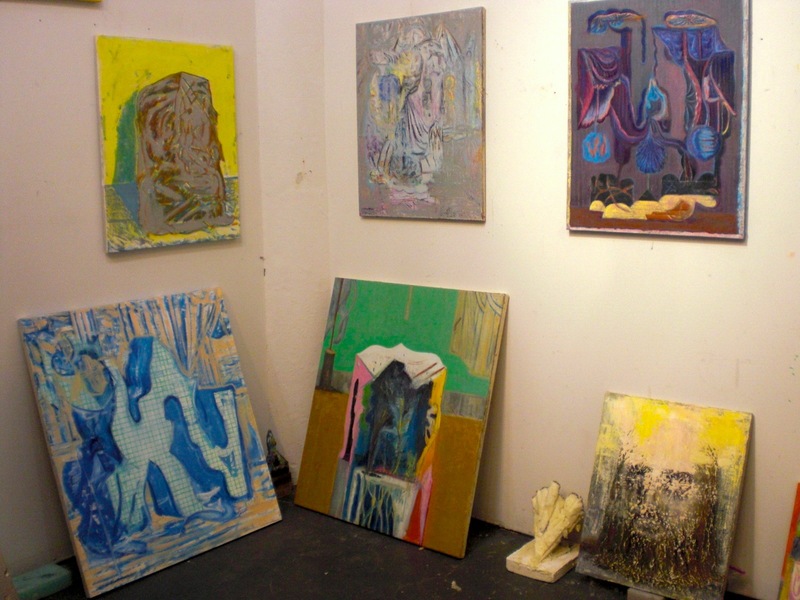 A couple weeks ago, I was directed to what was labeled as a storage facility in the outskirts of Red Hook, but turned out to be yet another artist anthill, the labyrinthine hallways ultimately leading me to painter Michael Berryhill's studio. I was excited by the chance to spend a studio day with him, already looking forward to his upcoming solo show at Kansas, which opens May 17th. Imagination plays a big role in Michael's practice, as he dreams up unmade sculptures or nonexistent spaces. 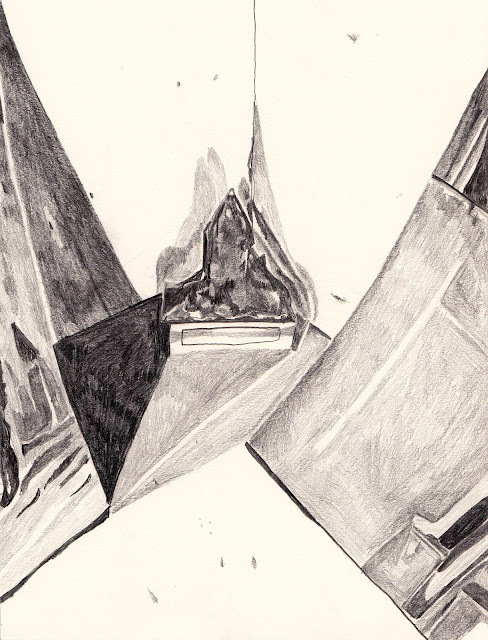 But how does he come to this collection of fantastical and hypothetical artworks and constructs? 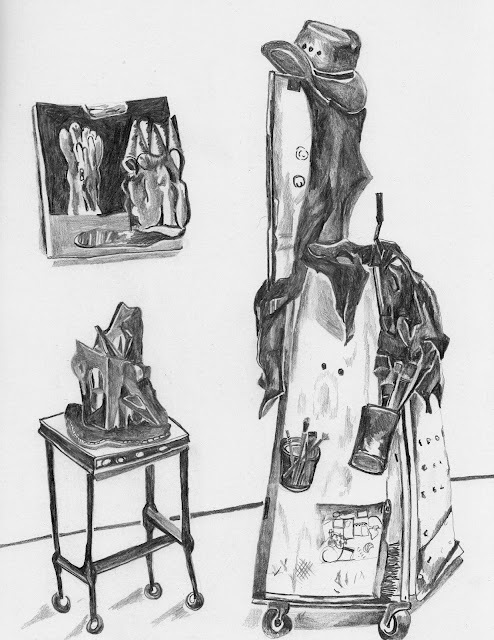 Michael sat down with me to draw that day in his studio. We were studying the same subject, his paintings. And in doing so a lot of questions were answered. 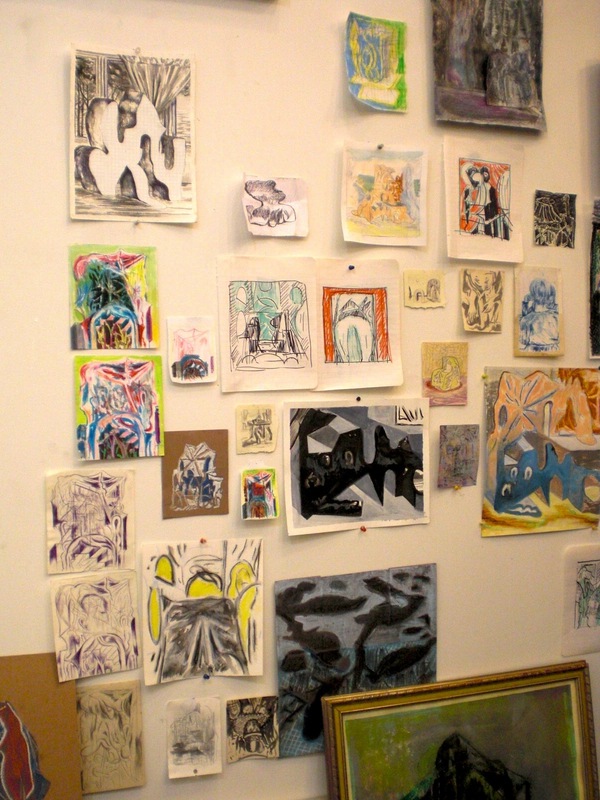 The walls of Berryhill's studio read as a saturated salon of works: from those that are in the whispering steps of progress, to those that are modeled drawings of pieces to come, to those that are fully realized paintings, or even sculptures, as I quickly discovered. He described to me one of the steps he takes within his process. He often maps out a painting's next move by drawing it on separate pieces of paper many times over. He uses different combinations of color for each drawing, sometimes adding structural formations or spatial elements not already existing in the original piece. While one painting leaned in anticipation against the wall, Berryhill recaptured it six different times with vibrant colored pastels, the drawings becoming works in their own right. There is something about this part of his practice that seems so generously focused, giving each piece careful consideration in its development of form and color. It is as though he is making a theater set mock-up, retroactively. So that he might see if structure is sound and perfectly placed on the stage -- before it is ready to perform its dazzling visual acts. In some cases Berryhill has begun to recreate these peculiar sculptures in actual three dimensional form as separate completed works. I especially liked peering through one's perfectly illogical doors to catch the backdrop that was his own painting on the other side. On the other hand, Berryhill allows himself to fully reinvent a painting after he has finished making it. He told me that some might have a history of multiple pieces hidden within it, that he is not afraid to cover up older works. I became engrossed with trying to imagine what was beyond the first stratum of some of the pieces up on the wall. I recently read an article about a Van Gogh painting that had only been discovered after x-rays revealed an image of two half-naked wrestlers underneath a previously anonymous still life. Van Gogh had written a descriptive letter of these wrestlers being in a painting to his brother around the same time it would have been made. I am sure if you lifted the layers of a Berryhill you would find different stories, a catalogue of past imagery -- letters, if you will, of his many different worlds. There is something in his work that seems to be paying homage to the greats of the early part of the 20th century, be it in its use of drawing, or in the tradition of landscape and space as subject. I also see him giving a nod to the early Renaissance, with his paintings awkward staging of perspective, iconic placement of form and charged approaches to color. Berryhill and I listened to Bossy Pants (Tina Fey's autobiography) while drawing, laughing, and discussing Fey's ultimate coolness. He introduced me to some local bands I hadn't heard of and we talked about the importance of matching the music's speed to the speed of the art you might be working on from one moment to the next. Having gathered the data I needed for my project I left Berryhill to figure out which drawings of the six would be the right one to work from. I liked the blue and orange rendition myself. I can't encourage you enough to make it out to see his show opening at Kansas this May, it is going to be something else. To check out more go to http://kansasgallery.com/michael-berryhill-main.